Since 1993, 20,000 people have died in the Mediterranean Sea while fleeing war-torn Africa for the safety of European shores. Now, the world's first private maritime search and rescue operation is doing everything it can to help them. And they've already saved thousands of lives. The UN estimates that 207,000 people tried to clandestinely cross the Mediterranean last year. A number that's accelerating rapidly as conflicts on that continent grow worse. Migrants fleeing Syria and Iraq are adding to their numbers as they travel from the Middle East to Libya before enlisting human traffickers to smuggle them into Europe. Forget the politics for a second, these are hundreds of thousands of men, women and children taking to the sea aboard what are often unsafe, overcrowded vessels that catch fire and sink and on which they may have inadequate access to food, drinking water and medical supplies. On October 3, 2013, a boat carrying over 500 migrants caught fire and sank just a quarter mile from the shore of the Italian island Lampedusa. Over 360 people lost their lives, within view of the shore. It served as a wake up call for European authorities. Migrants often travel to Europe aboard rickety old fishing vessels which are both unreliable and over loaded. Human traffickers cram them so full that there's no room left for essential supplies like water or even shelter. Increasingly, voyages are taking place during inclement weather as the traffickers try to avoid their own arrest by Italian authorities. Pope Francis offered prayers for the victims and called on his followers to help, stating, "Let's unite our efforts so that tragedies like this don't happen again. Only a decisive collaboration of everyone can help and prevent them…It is a disgrace." In response, the Italian government launched Mare Nostrum, but an American businessman living in Malta, close to the main smuggling routes, also heard the plea. Christopher Catrambone is an immigrant himself, having moved his family to Malta from his native New Orleans to flee the aftermath of Hurricane Katrina. Last year, he and his wife Regina say they invested "nearly 50 percent of our savings" — $7.5 million — to purchase a 130-foot search and rescue ship, two drones and two inflatable boats, then put them to sea complete with a crew of technical and medical experts. "No one deserves to die at sea," reads the Migrant Offshore Aid Station's call to action. At sea, MOAS patrols the main smuggling route between Libya and Italy, using its two Schiebel CamCopter S-100 drones (above) to search for migrant-carrying vessels that may be in trouble. Each CamCopter is capable of operating at speeds up to 150mph and can remain aloft for over six hours, making the potential search area huge. If they find a vessel that may be in need of assistance, MOAS then decides to either respond itself aboard the Phoenix I mothership (above) or call in the Italian Coast Guard if the boat in question is in imminent danger. Those extra eyes in the sky are one of MOAS's main functions, providing additional search and surveillance capabilities to augment the Coast Guard's own. Identifying at-risk vessels that may be in need of assistance before their situation becomes critical. "When a migrant vessel is spotted by one of MOAS's camcopters, we immediately provide visuals to the appropriate official Rescue Coordination Centre to help ascertain the vessel's condition and the migrants' needs," explains the NGO. "We then assist as directed." The Phoenix I's main mission is distributing humanitarian aid to refugees in-transit: water, food, medical aid and medical supplies. If it finds itself in a position to pull migrants off a sinking ship, MOAS is prepared to and has brought them onboard the Phoenix, but then defers to Italian authorities to decide where those refugees are taken. "MOAS follows the laws of the sea which oblige all vessels to help in case of distress," it states. "Thus, MOAS will rescue migrants if it is asked to do so by search and rescue authorities or if the situation is an immediate matter of life or death. 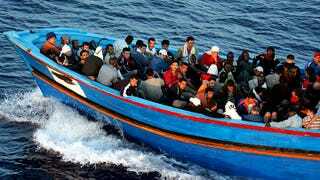 But our primary aim is to prevent loss of life at sea, not to ferry migrants from one point to another." MOAS is able to liaise closely with authorities in part because it employs ex-government and military officials to run its operation. Its director Martin Xuereb, for instance, was formerly the Chief of Defense for Malta while the ship's captain was formerly that country's Search Mission Coordinator. Catrambone himself provides medical services and insurance to companies operating in war zones. "There are many larger NGOs trying to reduce poverty and conflict in Africa and beyond," MOAS explains. "Many also work on integration and asylum once refugees reach Europe. However, at the point where migrants are most vulnerable — when it is a clear matter of life and death — there is an immediate need to act." "Last year, 3,419 men, women and children died while making the dangerous crossing to Europe…mostly by drowning or dehydration," the organizations says. During its first 60 days at sea alone, MOAS aided about 3,000 people. Want to help? MOAS relies on donations to supply migrants with emergency rations, water and medical supplies. You can help them buy those supplies through its website.